Traditional and super stylish, our Park Lane Worcester Basin and Bath bathroom taps set is the perfect way to update your bathroom. Whether you’re undergoing a complete renovation, or you just want to add a little luxury to your existing bathroom, this set is the ideal way to add an instant wow factor. As one out of two parts in this stylish set, the Park Lane Worcester Basin Taps will add instant class and traditional style to your bathroom. The striking combination of the stunning crosshead handles with the beautiful long spouts make these bathroom taps truly eye catching. The classic style works well in more traditional bathrooms, but the taps have been updated to provide ultimate practicality and functionality. Made from solid brass, these taps are built to be durable and made to last. Plated in the highest quality chrome, the end result is a tap that will stand the test of time, always looking beautiful and functioning perfectly. 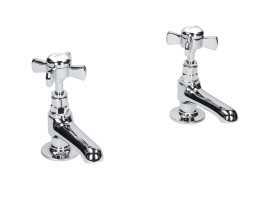 The chrome plating creates a stunning shine, making the taps easy to clean and rust resistant. Matching the basin taps perfectly, the Park Lane Worcester bath taps will create a cohesive finish to your bathroom. Traditional in style yet modern in function, these are the perfect taps to update your bathroom. Looking beautiful on a roll top bath as well as a simple corner bath, they will fit nearly at the end of your tub creating a striking yet simple feature. Made from solid brass and precision engineered, the taps have been coated in several layers of high quality chrome for a high shine finish. 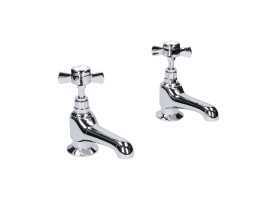 Durable and sturdy, the taps have been made to stand the test of time, are easy to clean and will not rust. Perfect for use in older homes, from Victorian to Georgian, this is the perfect set to update your traditional bathroom.